According to the NOAA, as of 8 p.m. ET on Saturday, the eye of Florence is now about 45 miles south, southwest of Florence, S.C. (yes, Tropical Storm Florence near Florence), and 65 miles east, southeast of Columbia S.C., where the University of South Carolina is located. The slower the storm is moving, the worse the flooding becomes. And that’s a problem, considering many news outlets are reporting that already 9-to-12 people are dead. That’s up from 7 casualties many outlets reported this morning. 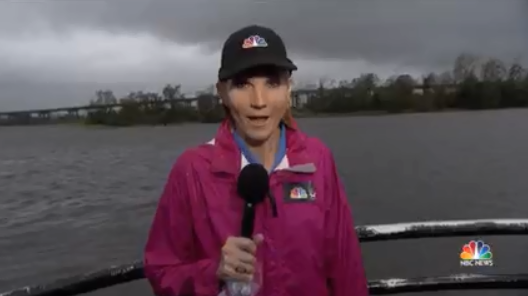 An interesting moment from today’s coverage: CBS News’ Adriana Diaz was set to do a hit, when a herd of deer made their way down a nearby Jacksonville, N.C. street in head-deep water. “I hope they’re OK, they look like they’re swimming,” said Diaz. CBS News’ Mark Strassman flew with the Coast Guard for the CBS Evening News to rescue storm victims. One-by-one, thirteen stranded Florence victims in Jacksonville, N.C. were hoisted 40ft into the sky to safety. Fox News’ Rick Leventhal reported from Wilmington N.C. this evening for Fox Report hosted by Jon Scott. Leventhal mentioned hearing about sporadic instances of looting in the area. Leventhal also reported that power outages are across the town, the state and officials don’t know when people will be able to go home. “We’re hoping that flooding doesn’t get worse, but we’re hearing that it probably will,” Leventhal continued. Both ABC and CBS aired college football games in the late afternoon, as is customary on Saturdays at this time of the year. Each broke in with special reports during halftime. 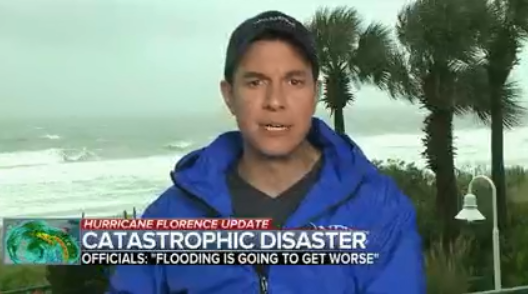 Good afternoon, I’m Tom Llamas reporting from the storm zone in Myrtle Beach, South Carolina. What is now tropical storm Florence is wreaking havoc over the Carolinas. It extends over 350 miles, and as you can see and hear behind me, the downpours are endless. Three straight days of heavy wind a lot of rain at Snead’s Ferry. But the flood threat is getting worse. Further inland, neighborhoods under water. New evacuation orders issued today. Roads shut down between parts of two major interstates. Storm damage triggering evacuations, including these residents of a senior home. It’s already claimed 8 lives and there are hundreds that need to be rescued. Victor Oquendo with that part of the story. Oquendo: Jacksonville N.C. is underwater right now. At least 20 inches of rain have fallen and there’s no sign of this slowing down. Neighborhoods are flooded, and we’re seeing active search and rescue missions being carried out. Volunteers taking their boat out, trying to get to people trapped in the their homes. Folks are checking in on their businesses as well. The governor of North Carolina calling the flooding in his state “epic,” and says “the danger is not over yet and people need to shelter in place.” The storms and flash flood threats are on the move. Let’s get to Sam Champion tracking this today. Champion: This is incredible. The center of circulation has not moved. Look at those rain bands. They’re carrying two to three inches of rain an hour. Just to show you how moisture that this, the little river in Fayetteville is forecast to jump 16 feet in just 24 hours…Eventually the storm will weaken and get kicked up into the mountains to places like Asheville, which could get 6 to 10 inches of rain. Jeff Glor broke in with a CBS News Special Report during halftime of LSU-Auburn, 5:30 p.m. ET. Kate Snow anchored NBC Nightly News Weekend in the usual slot, as Notre Dame-Vanderbilt ended before 6:30 p.m. ET. 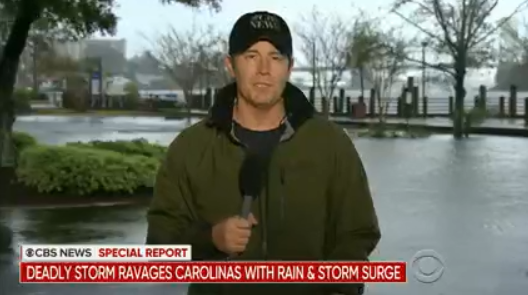 NBC News correspondent Garrett Haake joined the broadcast from New Bern. He said he used a drone earlier in the day to get to neighborhoods he previously wasn’t able to get to on foot. He found blocks of homes surrounded by water.